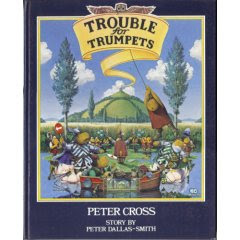 Trouble for Trumpets is a timeless story of good versus evil: "As the Trumpets, summer creatures who live in a world of warmth and sunshine, prepare to hibernate, the Grumpets, winter creatures who live in the dark, frozen mountains of the north, prepare to take over their land." What makes this book an amazing read, however, is the amazing artistry of Peter Cross. First off, who wouldn't love a Trumpet (or Grumpet, for that matter) - they're a cute cross between a hippo and a teddy bear, with English style to boot! The tale is narrated by Podd, a watchman of sorts for the Trumpet folk. As he helps to defend his people from Grumpet attack, you're drawn into page after page of intricate scenes detailing everyday Trumpet life. With influences ranging from Magritte to M.C. Escher to Rube Goldberg and more, you'll find yourself spending hours looking for the hidden oddities / faces / jokes in every realistically-but-magically drawn page. I swear that everytime I picked up this book, I found yet another new thing to amaze myself. My grandfather gave me this book before he passed away so it holds a great deal of sentimental value for me; when I went online recently to find a copy for a relative, I was amazed to see that it fetches quite a bit. (Somehow, I was lucky enough to stumble upon a second copy at a local used bookstore for just $5 - woohoo!) Anyway, I highly recommend skimming through a copy if you're ever lucky enough to snag one! You have until February 23 to enter our Blogaversary Children's Book Review Contest to win some great new books. Click here for details and send your submissions to daddyinastrangeland@mac.com.